My name is Vittal and I come from Gadalegaon village, Bidar district. 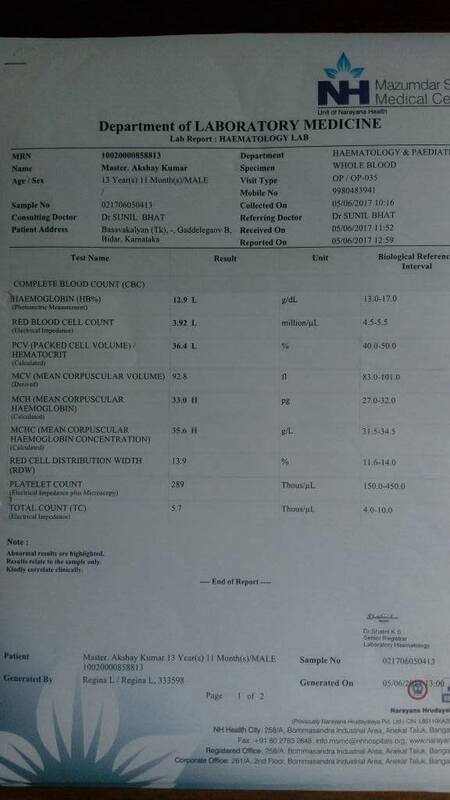 My 13-year-old Son, Akshay Kumar is diagnosed with Acute Myeloid Leukaemia (AML), a form of blood cancer. He complained of rashes and he was bleeding from nose. We took him to a doctor at Sholapur. Later he was referred to Kidwai, Bangalore. 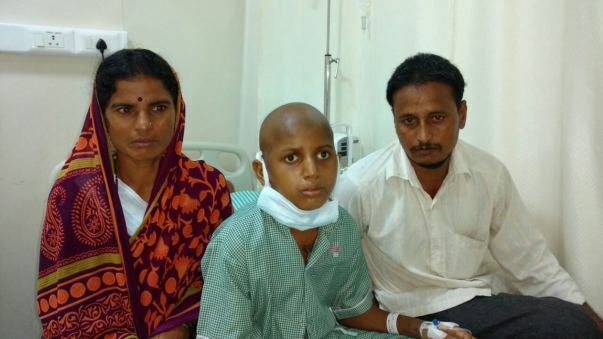 Specialists at Kidwai referred him to Narayana Hrudayalaya for Bone Marrow Transplant. I am a farmer and my wife, Sunitha, works part time in the my village. We have 4 children and it what we get from farming that feeds all of them. 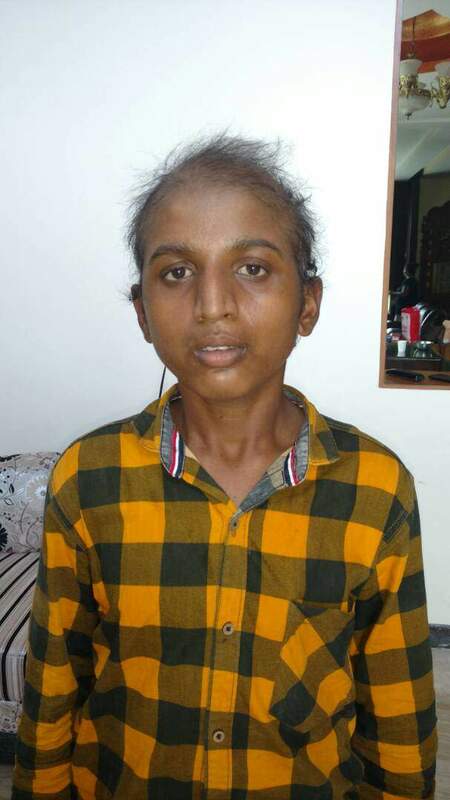 To save my son, I took a loan of 2 lakhs which I already spent for Akshay's treatment. Since I have to be with my son in the hospital, there is no one to take care of farming. I didn't have money to pay for my daughter and she had to quit college due to this. My elder son is working for daily wages to get some money to feed us all. 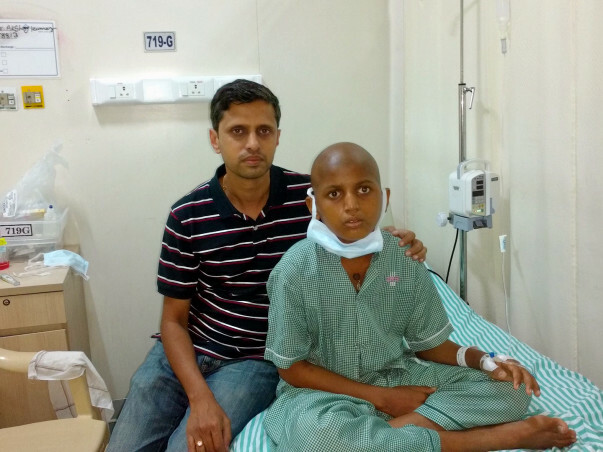 Akshay is being treated at Narayana Hrudayalaya Hospital. 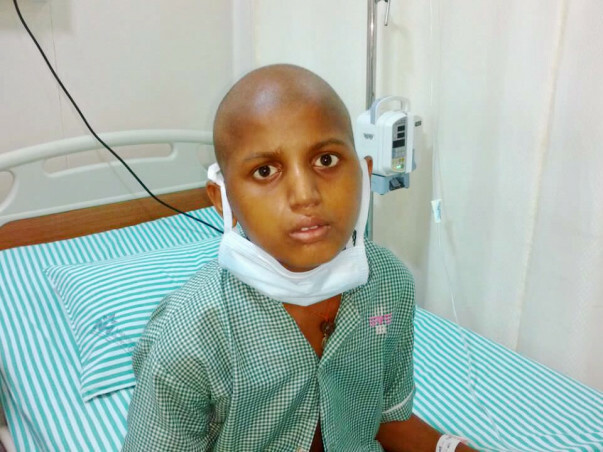 He completed chemotherapy last week with the help of Mazumdar Shah Medical Foundation. Akshay's doctor recommended a bone marrow transplant is the best option with an approximate long term survival rate of 70%. Fortunately he has a completely HLA matched sibling. The doctor informed that he should undergo the transplant next week. 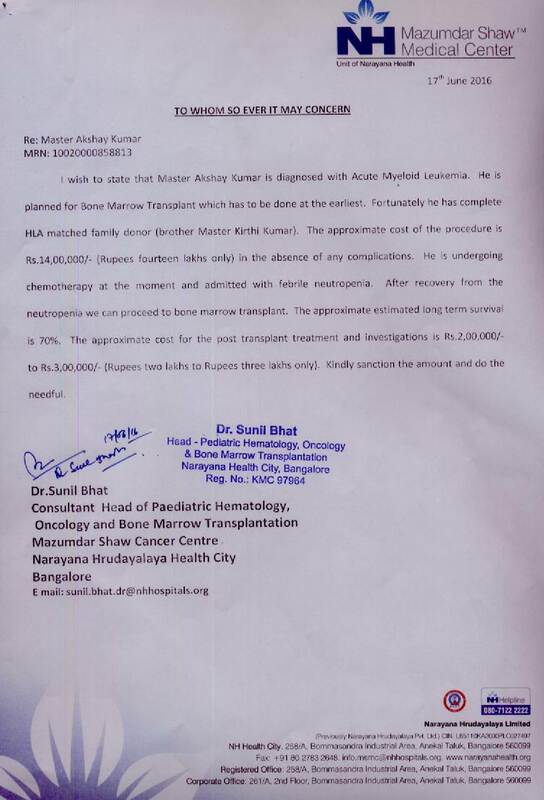 Since we have a matching donor, approximate cost of procedure is 14-16 lakhs. I need your support to ensure my son gets this transplant done. For me this amount is impossible to collect but as a father this is last option I have to save my son. Requesting you all to support me. Funds raised through the campaign will be utilized for Akshay's bone marrow transplant. Akshay is doing good. He has recovered well. He is going to school now. He is coming to the hospital for follow ups every 4 months. Akshay Kumar is currently at home and has responded well to the treatment, there was a good pace of recovery. Yesterday, the family came to the hospital for the routine check-up. He needs normal medication and needs to visit the hospital for for follow-ups for couple of months. We are grateful to all of you for the love and support you have shown Akshay. Its been a while I posted an update on Akshay's progression. By god's grace and with all your support, he is doing well. He is coming to Bangalore for monthly check-up and they are in constant touch with me. 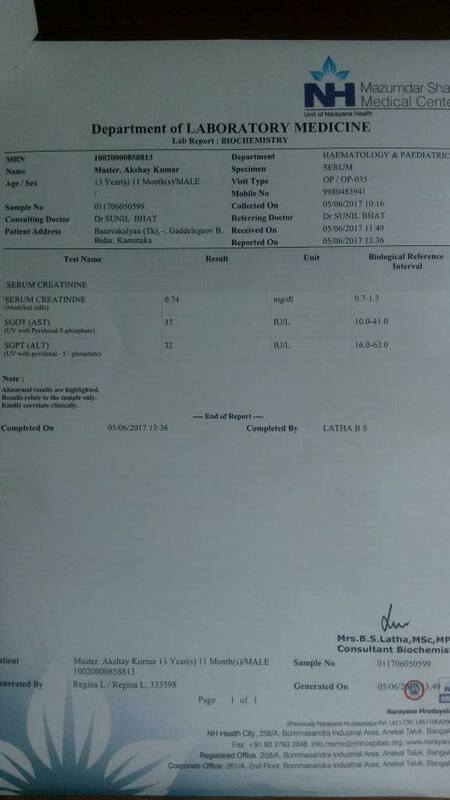 I am sharing his latest picture taken in my house on June 4th and his latest blood report. The counts have been improving gradually over last few months and getting closer to normal. Doctors are very happy with his progress and have asked them to visit once in 45 days going forward. After the treatment, the family was in a deep financial crisis due to loans they had taken. The interest was piling up and the land was being used by the Lender as per their agreement. We decided not to use milaap collected sum towards this, to keep the account books clean. To help family's financial situation, Sanman volunteers helped to pay off the interest and we have arranged for interest free loan to cover the principle amount so that they can get back their land and make their living with agriculture. Akshay's father is getting ready to grow Toor dal and Urad dal this monsoon season. Akshay is going back to school from August and he would like to study medicine when he grows up and help treat cancer kids. Akshay's family and I are truly grateful for all the support from each one of you. I would also thank MSMF that covered a good part of Akshay's treatment and provided good discounts for his treatment. I will share detailed financials in the next post. 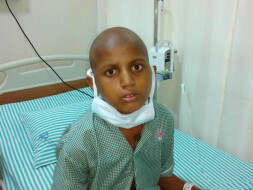 All the remaining money will be transferred to MSMF to support more needy kids like Akshay.